Giiirrrrl, we are about to get real today. No really. If you’re not interested in a whole lotta TMI, you should just click away now. But if you’re like me and interested in all the deep dark weird secrets of complete strangers on the internet, well then you’re in the right place. Real quick though. The recipe I’m featuring today includes one of my 10 Healthy Pantry Staples that you MUST have. Find out what the others are and you’ll be on your way to optimal health without killing your budget. 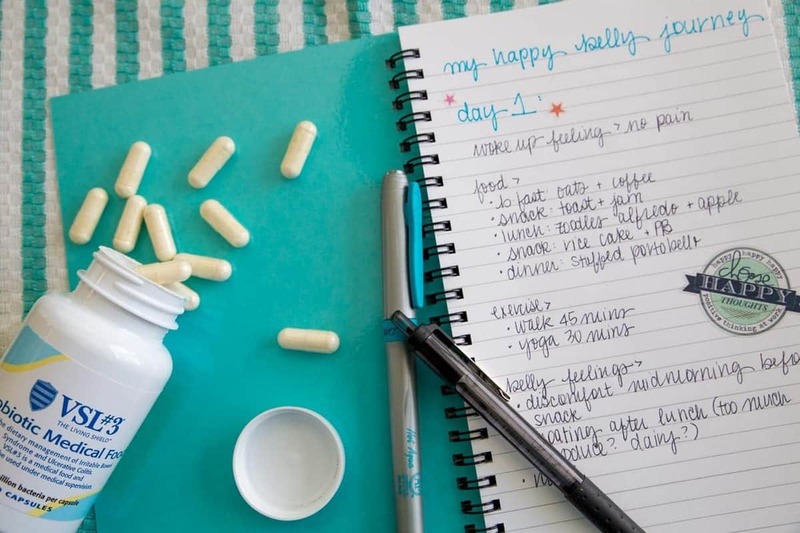 Ok, so as I’ve talked about a few times here, I have dealt with a lot of health issues over the years, and often times I really don’t feel well. At the end of last year, I went to my doctor because I was experience stomach issues that just wouldn’t go away. I told her all my symptoms (that we’ll get to here in a minute). I told her I’d been tracking my foods in relation to these symptoms. I told her it was all really interfering with my everyday life. I mean, there are sometimes I’m unable to get off the couch because the stomach pains are just too much. I’ve been dealing with this for years, and it was time to get it figured out. Did I have an ulcer? Celiac disease? What about lactose intolerance? Or maybe something even more serious like cancer?! Yikes, I was scared outta my mind going into the appointment. Wait, what? Really? In my mind, IBS (irritable bowel syndrome… dude, I told you we’re full on TMI today) was only for people who couldn’t control their poop. I know it’s no laughing matter at all, but I pictured people with IBS unable to leave their houses because they were practically chained to their bathrooms or had to be in close vicinity to one at all times. No way did I think I had IBS. A “burning” feeling in my stomach up through my chest – turns out this is acid reflux, something I thought only babies got. If I didn’t eat the moment the moment I felt hungry, symptoms would flare up and would usually be unable to calm down for hours – which put me on the couch or in bed for hours. Turns out IBS can show up in many different forms with a large range of severity of symptoms. So after running some blood work and not discovering a more serious issue, my doc put me on an acid-reliever to help the IBS and sent me on my merry way. Let me tell you, I am not a fan of drugs. I worry that I’m covering up a more serious issue. But at the same time, I was looking for comfort and a bit of normalcy. Well, that was over 7 months ago, and although I’m feeling a bit better, I’m definitely not 100%. I have stomachaches almost every day, some worse than others. I’m still just wondering what the heck is wrong with me. I’ve read a lot about probiotics and have wondered if maybe I just don’t have enough healthy bacteria in my gut. So when I was contacted to try VSL#3, a high potency probiotic medical food, I was totally interested in giving it a try. VSL#3 is clinically proven to help manage digestive issues for IBS and ulcerative colitis sufferers, such as bloating/gassiness and discomfort. VSL#3 is different from your yogurts and kefirs that have the perks of containing probiotics because VSL#3 contain 8 strains of live bacteria, making it 10 times more potent than your average probiotic. In case you’re curious what probiotics are, they are good bacteria that can make the difference between a healthy/pain-free gut to an unhealthy/grumpy gut. I want the happy gut for sure! While many people are familiar with the general term “probiotics,” most do not understand the importance of knowing which specific strain of organism should be used for which specific disease or condition. * I know I was completely in the dark until learning more about VSL#3. In fact, up to 20% of U.S. adults have IBS symptoms, yet many never seek medical help for it. Listen, I know it can be awkward. I get it. Talking about your poop to a stranger is not the most pleasant of things. But doctors have heard it all. Really. You will not be the first person to tell them about poop. Besides, if I can stand in front of the entire world wide web to chat about what’s going on in my gut, I’m fairly certain you can manage it behind closed doors at the dr’s office. Yeah? Don’t you want to feel better? Ask your doc about VSL#3. Tell him you heard about it and would like to give it a try like I am. I’m looking for any sort of relief in the daily discomfort I feel, and I bet you are too. On top of taking VSL#3, I’m going to start paying more attention to the foods I eat that don’t jive so well with my stomach and hopefully will start making some more IBS-friendly recipes like these ones. And I’m going to be tracking my experience with VSL#3 and see how my symptoms improve. I sure hope they do! Another great thing I learned from VSL’s website is the recipe collection they have of IBS-friendly foods. Things that won’t leave me on the couch in pain. I haven’t been able to find any real correlation to certain foods and my stomach pains, but I’m definitely all for giving these “safe” foods a try. 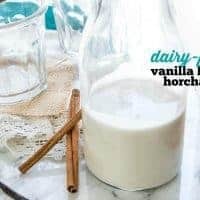 That’s where this super yummy and refreshing horchata recipe comes into play. 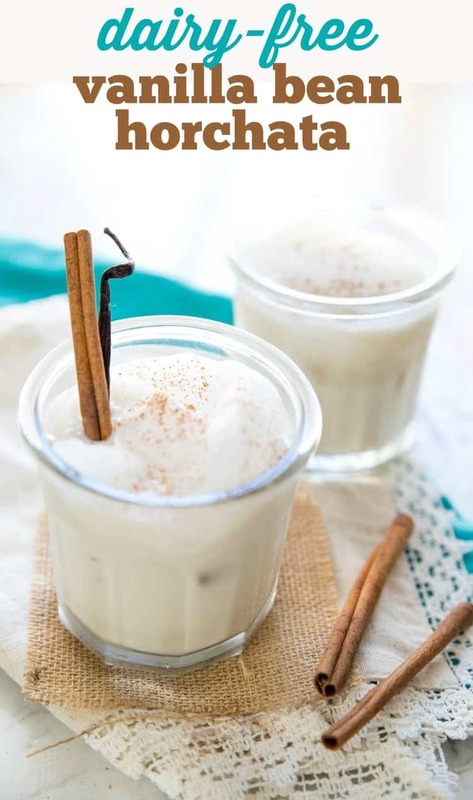 The cinnamon and fresh vanilla bean gives it a warm comforting flavor. Yet the ice cold almond milk cools you down when it’s hot as heck outside like it’s been lately. Wowza. So now that you know way more than I ever wanted you to know about my gut, my poop, and my overall well-being, I am happy to share this super easy recipe with you. I hope you give it a try, whether you have belly issues or not. Place the uncooked rice in the bowl of a blender and grind them briefly to break the rice grains into pieces. 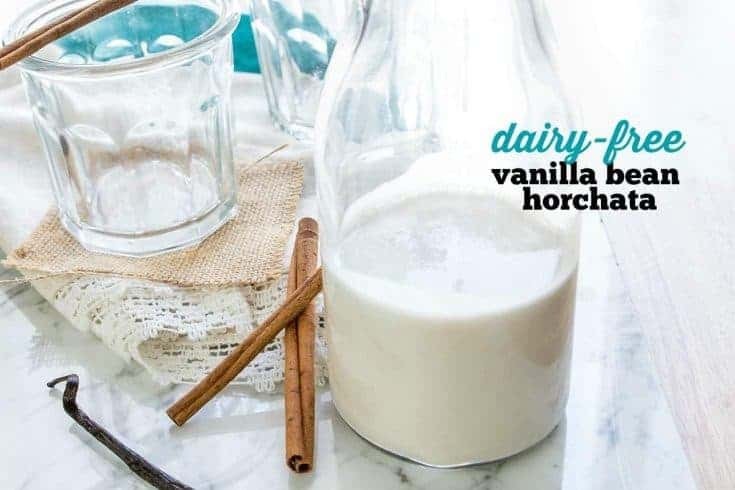 Add the milk and water, whole cinnamon stick, and vanilla bean. Cover tightly, refrigerate, and allow to soak in the refrigerator until the next day. 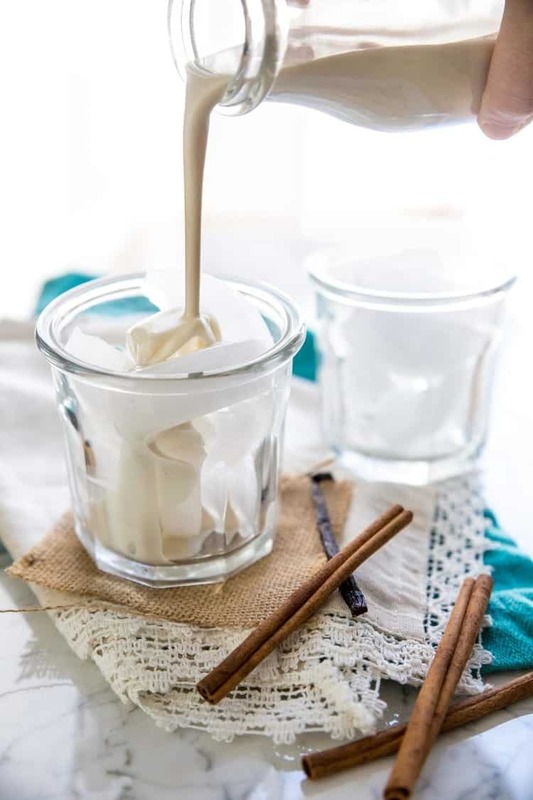 Remove the cinnamon stick and vanilla bean and discard. 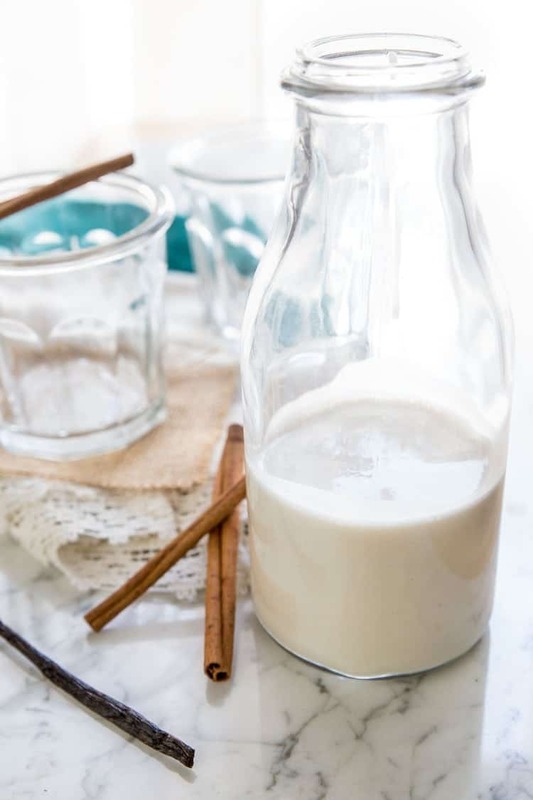 Add the agave to the milk mixture and blend at the highest speed for about a minute, perhaps less if you have a high-powered blender. Allow the solids to settle briefly. 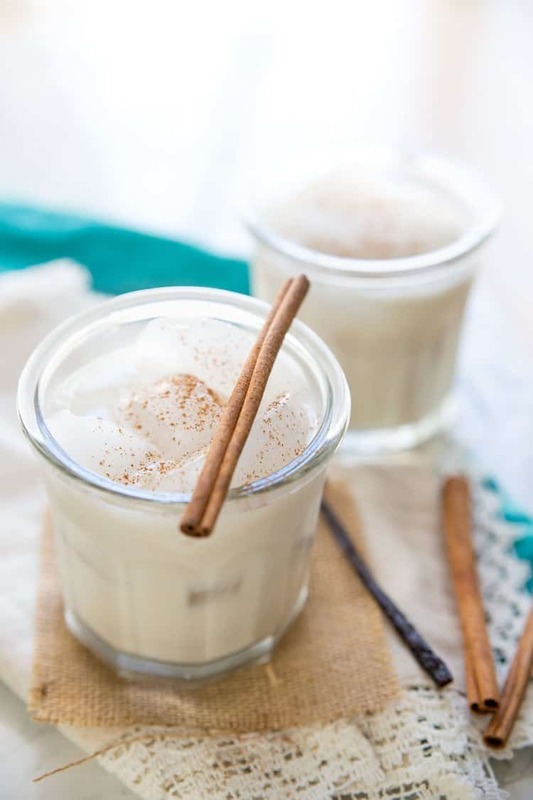 Pour the horchata through a tea strainer or nut bag into serving glasses full of ice. Sprinkle with ground cinnamon and serve immediately. Ask your healthcare professional for a VSL#3 Patient Savings card and save up to $80 each month on your purchase of VSL#3 products; the largest savings ever offered for both VSL#3 and VSL#3 DS. Visit this site for more information and talk with your healthcare provider today so you can take part in the savings program! And don’t forget – grab your free guide to find out what you should be stocking your pantry with!